According to a 2017 report, the U.S. Energy Information Administration projects a 28% increase in world energy consumption by 2040. And the energy sector is a major contributor to climate change. For example, energy production and use accounts for more than 84% of U.S. greenhouse gas emissions. Increasing the efficiency of energy consumption has benefits for consumers, providers, and the environment. With an increasing number of IoT devices coming online in the energy sector, there is more and more data that can be used to monitor and track energy consumption. Ultimately, this type of data can be used to provide consumers and businesses with recommendations on ways to save energy, lower costs, and help the planet. In this challenge, you will use standard AI tools to identify 11 different types of appliances from their electric signatures, quantified by current and voltage measurements. This plug load dataset contains current and voltage measurements sampled at 30 kHz from 11 different appliance types present in more than 60 households in Pittsburgh, Pennsylvania. Plug load refers to the energy used by products that are powered by means of an ordinary AC plug (i.e., plugged into an outlet). For each appliance, plug load measurements were post-processed to extract a two-second-long window of measurements of current and voltage. For some observations, the window contains both the startup transient state (turning the appliance on) as well as the steady-state operation (once the appliance is running). For others, the window only contains the steady-state operation. The observations were then transformed into two spectrograms, one for current, and one for voltage. A spectrogram is a visual representation of the various frequencies of sound as they vary with time. The x-axis represents time (2 seconds in our case), and the y-axis represents frequency (measured in Hz). The colors indicate the amplitude of a particular frequency at a particular time (i.e., how loud it is). We're measuring amplitude in decibels, with 0 being the loudest, and -80 being the softest. So in the example spectrogram below, lower frequencies are louder than higher frequencies. 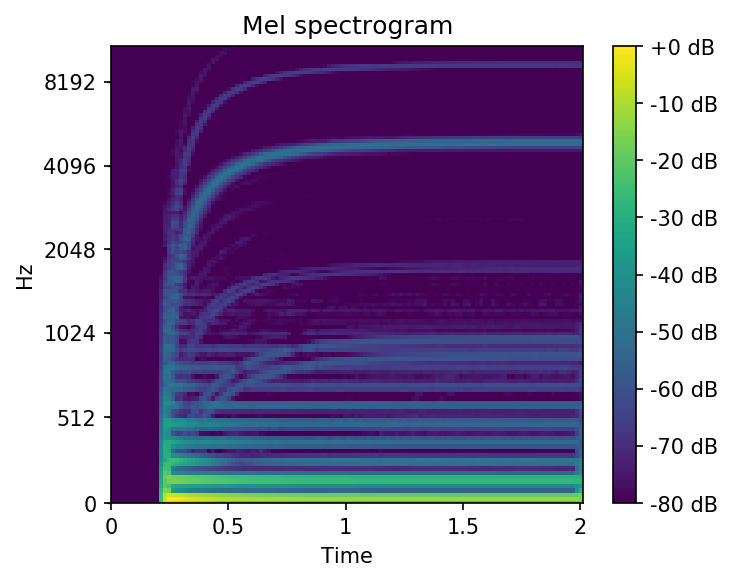 Our spectrograms tend to have horizontal lines given that we are capturing appliances in their steady-state. In other words, the amplitudes of various frequencies are fairly constant over time. Takes the fourier transform of a windowed excerpt of the raw signal, in order to decompose the signal into its consistuent frequencies. To learn more about fourier transforms, check out this awesome tutorial by 3Blue1Brown: But what is the Fourier Transform. Maps the powers of the spectrum onto the mel scale. The mel scale is a perceptual scale where pitches are judged to be equal in distance from one another based on the human ear. Takes the logs of the power (amplitude squared) at each of the mel frequencies to convert to decibel units. Plots and saves the resulting image. There is a lot of useful information encoded in these spectrograms. Now it's time to use your deep learning skills to parse out which patterns correspond to which types of appliances. You cannot sign up to this website http://datasciencecapstone.org ("Website") from multiple accounts and therefore you cannot submit from multiple accounts. Each registered individual or Team is referred to as a Participant. You may only compete using a single, unique Website account registered at the Website. Competing using more than one account per individual is a breach of these Competition Rules and Competition Sponsor reserves the right to disqualify any individual (or Team including an individual) who is found to breach these Competition Rules. If you meet the eligibility requirements and would like to participate, then you must first complete the registration process at the Website within the Competition Period. After you complete the registration process, you will receive access to the Data (described on the Competition page) that will enable you to develop and submit one or more Entries (as defined below). All Entries must be received during the Competition Period. To register, visit the Website and follow the onscreen instructions to complete and submit your registration. All of the registration information that you provide is collectively referred to as your "Account". (If you have already created an Account at the Website, enter your user name and password and follow the on-screen instructions). FORMING A TEAM. If DrivenData enables team functionality for this Competition, multiple individuals or entities may collaborate as a team ("Team"). You may not participate on more than one Team. Each Team member must be a single individual operating a separate Website account. You must register individually for the Competition before joining a Team. You must confirm your Team membership to make it official by responding to the Team notification message which will be sent to your Account. There are no prizes being offered in association with challenges hosted on datasciencecapstone.org. CHEATING. Participating using more than one Website account is deemed cheating and, if discovered, will result in disqualification from the Competition and any other affected Competitions and may result in banning or deactivation of affected Website accounts. CODE SHARING. Participants are prohibited from privately sharing source or executable code developed in connection with or based upon the Data, and any such sharing is a breach of these Competition Rules and may result in disqualification. Copyright © 2019 DrivenData, Inc. Microsoft® and the Microsoft logo are trademarks of Microsoft, Inc. EdX® and the edX logo are trademarks or registered trademarks of edX Inc. All Rights Reserved.